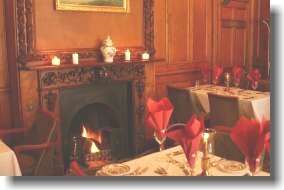 Make your visit to the Tyrrells Ford Country Inn extra special by having lunch or dinner in our wood-panelled restaurant overlooking extensive lawns and gardens. 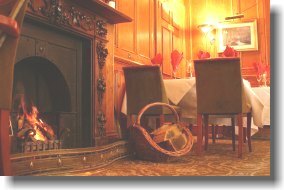 We can offer our guests far more than just another hotel restaurant, as we provide the charming and comfortable surroundings and create a relaxed atmosphere where you can enjoy high quality ingredients sourced from mainly local suppliers prepared by our award winning chef. The Tyrrells Ford team are very proud of the fact that our restaurant and frequently changing menus not only satisfies our guests, but also attracts the local community in choosing our beautiful surroundings, high quality food and friendly service again and again. Before lunch or dinner you can enjoy an aperitif in the comfortable bar. 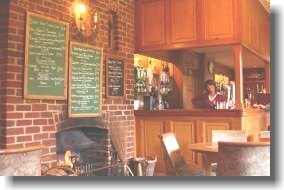 After your meal you can relax with the locals and enjoy a selection of traditional ales, cider and lager, or choose from a huge selection of wines and spirits. Food is also served in the bar and you can pick from a daily menu shown on a blackboard, or simply have a light snack. 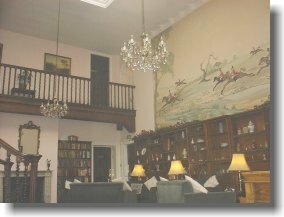 Tyrrells Ford Country Inn also has a magnificent Minstrels' Gallery Lounge where you can relax over coffee or drinks after your meal. 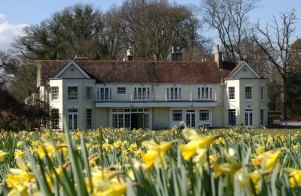 Whether you’re looking for a traditional Sunday lunch, afternoon teas, romantic meal for two, lunch or dinner with family and friends, or a larger celebratory party, our award winning chef and his team will ensure your visit to the Tyrrells Ford at Avon is a memorable experience.